1) Hello Kitty Tokidoki Items! Actually I really need new luggage~ because my old ones are super cracked inside! Every time I use it, there are always those small cracked falling pieces everywhere! 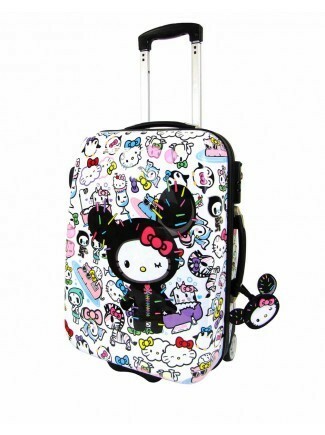 The things with Hello Kitty luggages is that they look pretty small... Feels like they can only fit my items for one day of travel... ..MAYBE..
On the side note here, HK tokidoki is doing these keychain collectable things in Hong Kong 7-11! Don’t they look super cute?!?!?!? Man, I so want to collect but I’m not in Hong Kong! the Cosmetic bag is pretty cool too~ because it’s sturdy and structure is somewhat like a coin purse~ very protective of your cosmetic items! I was also tempted to buy the following bag, but in person it just seems a bit huge.. not suitable for everyday use. ~ & it doesn’t have duo carry option. it would be tiring to carry such a huge bag by hand all the time! I wish the design of the bag can be better.. because I love the print so darn much! So one thing I like to look at is furnitures. They always fascinates me! Just like Fashion and many other art things! & the one thing I really want and really need right now is a large super nice and pretty Closet~!! These look simple and plain, but with just a switch of the door knobs, they would look very pretty! Plus I LOVE white! So I think they can look very elegant! You must think I’m joking when I say I don’t have a full size mirror. It’s like every girl’s must have item!?! Actually I used to own one. Those cheap Walmart kind, I guess they got lost over the times when I moved...but those are not really really “ full size”.. I mean I guess it could work, but I really want a HUGE mirror! I saw this huge mirror at IKEA and I kind of really want it. but it’s like $130 ( vs walmart $6 or $9?!... ok let me think about it..) Of course it’s super sturdy and nice.. I really want one..!! Other mirrors I want are these decorative mirrors! Though according to Chinese fung shway, it’s actually not good to have to many mirrors inside the house. Personally I am not a superstitious person. In fact, I hate any kind of superstition because I think they just get in the way of my freedom! But there were many bad things happening to me this year. so for just 1 night, I sorta give in to superstition and start organizing my room according to fung shway..... so I put my mirror in a different direction so my SO n I won’t fight.. and guess what?! WE FOUGHT! Needless to say... I’m back to anti superstition person the very next day! Anyway, so I really need a work light to see things better when I’m making my cute Deco’s or Clothing's! I wonder if I should get LED light ones or just regular? I think LED is brighter.. but light bulb is probably much more expensive ?! I know this will be a long term goal.. so I’m not in a hurry. hopefully one day I can really have a room full of stuffed animals! <3 <3 <3!!! For this one, I’m not exactly sure what I want. Because expensive brands don’t always automatically mean they’re good for my skin. In order to avoid wasting $, I’m always super careful when I am trying to select Skin Care or Makeup. I been wanting to try this for a long time. But it’s quite pricy ~ & now they have different ( color) ones that I get more confused now! omg the prints are totally cute! tokidoki items are cute yet very pricey. LOVE the hello kitty bag!